Margaret Mary Huff was born the seventh child of Andrew Elick and Marguerite Delphine Huff on March 25, 1929 in Walla Walla, Walla Walla County, Washington. During the first ten years of her life her family moved from Walla Walla back to their homestead above Heppner, Oregon, then to Hermiston, LaGrande and once again back to the Homestead. Finally about 1939 the family moved to the Willamette Valley; first to Rose City (Portland) where they lived with Margaret's Aunt Nettie, Elick's eldest sister; then the family moved to Tobias and finally to Hillsboro. In Hillsboro they lived for a time on Walnut Street before finally settling into a farmhouse on an 11 acre strip of land south of Shute Park on SE 8th Street. Margaret graduated from Hillsboro Union High School in 1947. She went on to graduate from nursing school in Portland. It was in Portland, while chaperoning a dance that she met her future husband, Leonard A. Dieringer. The couple were married on May 6, 1951. The couple lived in Milwaukie, Oregon and then in the early 70's settled in Oregon City. 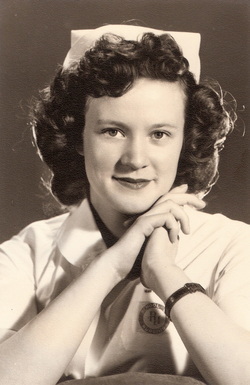 She worked as an RN at Providence Hospital for several years and then devoted her life to her family. Margaret and Leonard raised six children: Valerie, Gwen, Carla, Shari, Mark and Brian. In 2008, she and Leonard moved to Sublimity, Oregon. In the Fall of 2010 Margaret was diagnosed with Mesothelioma. She passed away at her home in Sublimity on the morning of February 17, 2011. Leonard A. Dieringer was the ninth child of eleven born to Frank Barnabas and Catherine Mary (Bellarts) Dieringer in Portland, Multnomah County, Oregon. He grew up in SE Portland. Leonard met his future wife in 1950 while she was chaperoning at a dance for nurses in downtown Portland. On May 6, 1951, he married Margaret Mary Huff. The couple settled in the Milwaukie/Oregon City area where they went on to raise their six children: Valerie, Gwen, Carla, Shari, Mark and Brian. After serving in the U.S. Army, Leonard owned and operated family-owned grocery stores and then went to to sell real estate for over 30 years. With the help of his wife and children, he also flipped houses. Leonard enjoyed gardening and had a "green thumb", he also enjoyed building bird houses and was a bird enthusiast. He especially liked to watch hummingbirds. Leonard's faith was a deep part of who he was and his gift was his strength of listening and giving faith-filled fatherly advice. He was an active member of St. Boniface Catholic Church and the Elks Lodge. In 2008 Leonard and Margaret moved to Sublimity, Oregon. In 2010 Margaret was diagnosed with Mesothelioma and passed away in February of 2011. Leonard remained in Sublimity. In the early hours of May 23, 2015, Leonard passed away in Salem, Oregon at the age of 85.